Coconut Milk Green Pulao is a simple, flavorful and delicious dish in which basmati rice is cooked with coconut milk, vegetables, herbs and spices. It is a very nutritious and wholesome dish with loads of vegetables. This can be packed for lunch box also. Today we will learn how to make Green Pulao with coconut milk or veg pulao with green masala following this easy recipe with step wise pictures. Wash and soak basmati rice in hot water for 30 minutes. Grind mint leaves, coriander leaves, cashew nuts and green chillies to a fine paste with little water. Add few drops of lemon juice to retain the green color. If using fresh peas, parboil it and keep it ready. Blanch cauliflower florets and keep it aside. Extract thick coconut milk and mix it with 1 cup of water. Alternatively you can use readymade coconut milk and mix it with a cup of water and keep it ready. You can check how to extract coconut milk. Heat oil + ghee in a pan, add the ingredients mentioned under seasoning. (fennel seeds/sombu is optional but adding it gives a nice flavor). Add thinly sliced onions and saute until onions turn transparent. Add a little salt to speed up the process. Add the ground paste/green masala and saute until the raw flavor goes. Add all the vegetables and mix well. Add soaked and drained basmati rice. Mix well, so that the rice is evenly coated with the green masala. Add coconut milk (coconut milk + water mixture), needed salt and mix well. When it starts boiling, reduce the heat to low and close the cooker. Place a small stainless steel cup (as shown in the picture below) instead of the whistle/weight to prevent the steam from escaping. You can open the cooker to check inbetween and stir gently. Once the rice is 90% cooked, turn off the heat. Heat a tawa, place the cooker on the tawa and cook on very low heat for 5-6 minutes. Turn off the heat. Let it sit for another 5 minutes. (If you do not prefer cooking on top of tawa, cook the rice fully in the cooker itself and skip this step). Then open the cooker and mix the rice gently. Fry cashew nuts in a little ghee and add it to the pulao along with the ghee. 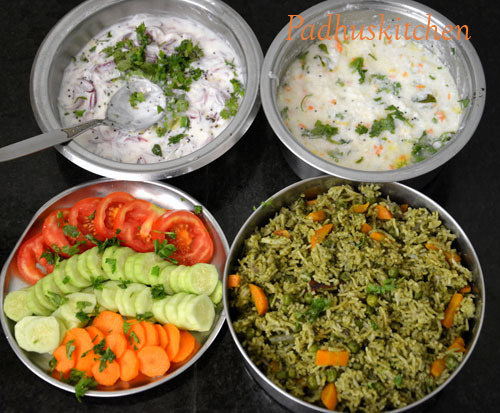 Serve pulao with raita/pachadi or chips or papadams. Note - Adding lemon juice and turmeric powder gives a nice colour to the pulao. 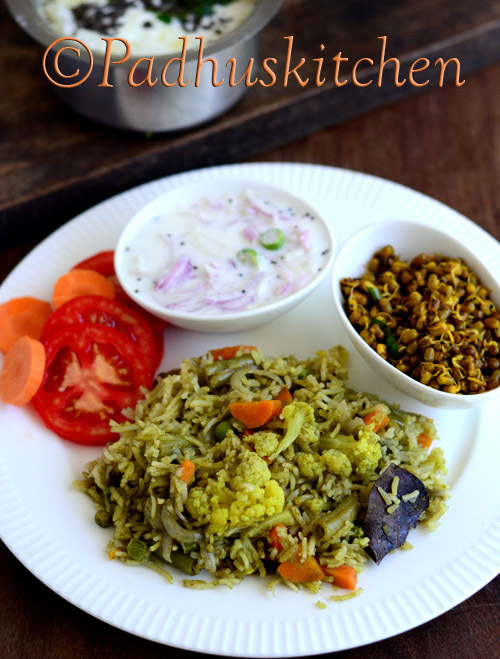 Our Simple and Healthy Lunch Menu - Green Pulao with coconut milk, seasoned curd rice, onion pachadi and salad. Wow...what a presentation. Nice job. I am sure it tastes good too. Hello Padhu - I have been complimented for my cooking skills from near and dear ones but the credit goes to you completely! I follow your recipes to the T and the green pulav has come out really well! Last week i made Okra Onion Garlic puli kuzhambu and it tasted out of the world with curd rice! My festivals and even daily cooking are imcomplete without you and keep it going girl! More Power to you! !